The regular season has reached its final week, but the playoff picture remains somewhat unclear. Some teams are trying to solidify District 4 playoff spots and others are hoping to earn first-round home games. Two conference championships also will be held this week with the Heartland Conference and Northern Tier League four-team tournaments starting Thursday. Needless to say, the regular-season’s last week should be an exciting one. The Class AAAA field looks nearly set at the top with Danville (18-2) having locked up the top seed and defending champion Montoursville (15-5) earning the No. 2 since it has a solid lead on No. 3 Shamokin (13-8) and No. 4 Mifflinburg (12-8). Those four teams look like good bets to host first-round home games. Surging Lewisburg (13-8) is No. 6 right now but is closing in on No. 5 Athens (11-6) and could move ahead if it wins its final game. Milton (8-14) and Jersey Shore (7-14) will almost certainly be the final two teams in with Milton holding a substantial advantage for the No. 7 spot. Loyalsock and Wellsboro met in last year’s District 4 Class AAA championship and both look like they will be the top two seeds this season. The Lancers (21-1) clinched the top seed and Wellsboro (18-2) holds a sizable lead over No. 3 Mount Carmel (18-4). A good battle is shaping up for the fourth seed with Central Columbia (15-6) holding a slight lead on North Penn-Mansfield (16-6) and Southern Columbia (13-7). Hughesville (9-11), Troy (7-11) and Warrior Run (6-14) are fighting for the final two berths. The Spartans look like they will be the No. 7 seed but winning at least one of their last two games would help seal that spot. Troy holds a slight advantage on Warrior Run so that one could come down to the final game for both teams. The Class AA field is the most interesting and unsettled. The only sure thing is Millville (18-1) being the top seed. So much could change in the next few days from there. Bloomsburg (10-9) has held the No. 2 seed the last few weeks but is far from certain to keep it. It grows more chaotic from there with Nos. 3-8, Northeast Bradford, Canton, South Williamsport, Wyalusing, Muncy and East Juniata all close together. Cowanesque Valley (8-11) is on the outside looking in, but only by a razor-thin margin so for nearly everyone in this field each game this week will feel like a playoff line because a lot will be riding on each outcome. In Class A, top-seeded and defending Class A Eastern Region champion Lourdes (18-3) could earn a first-round bye if both Northumberland Christian and Meadowbrook Christian opt out of districts since there are only nine teams in the field. If one elects to play then Lourdes will host the No. 8 seed. St. John Neumann (16-4) will be the No. 2 and North Penn-Liberty (13-7) and Galeton (13-6) are fighting it out for the Nos. 3-4 spot, but both have all but clinched first-round home games. On the strength of its schedule, Sullivan County (9-10) is ahead of Northumberland (14-5) for the fifth seed and is looking like a good bet to stay there. If Northumberland opts out, Bucktail (6-13) moves up to No. 6 and Benton to No. 7 with Meadowbrook the likely 8-seed if it competes. Loyalsock will have some postseason action before districts start, competing in the HAC Tournament for a sixth time in seven years. The Lancers have played in the last two finals, winning the 2017 crown, but who they play Thursday remains uncertain. Mount Carmel and Southern Columbia finished tied for first in the HAC-III, but according to league tiebreakers, Mount Carmel will win the title because it has a better record against all conference opponents. That would then mean the wildcard comes down to Montoursville and Southern Columbia and if that is the case, Montoursville would advance based on its better overall HAC record. If Montoursville does qualify, it likely would play HAC-I champion Danville. Wellsboro is seeking its third straight NTL Tournament championship and likely will host North Penn-Liberty Thursday. North Penn-Mansfield has played in the final each season since the tournament started and will play at Northeast Bradford. The winners play for the championship Saturday night at Mansfield University’s Decker Gymnasium. Although it has experienced so much frustration this season, Williamsport is coming on strong and has moved up to No. 2 in the District 2-4 Class 6A standings. The Milloinaires (6-12) have won two straight and thumped defending District 4 Class AAAA champion Montoursville, 68-44, on Saturday. If Williamsport can hold on to that No. 2 seed, it would likely receive a semifinal closer to home which could be a nice plus. The Millionaires are so close to having a record that could be reversed, losing eight games by seven points or fewer. That, though, is in the past and Williamsport is only focusing on its future. If it keeps building on Saturday’s performance that could be a good future, too. Ethan Williams scored 17 points and made six steals; Ahmir Ellzy grabbed 11 rebounds and dealt nine assists and Marcus Simmons added 16 points. The bench also shined and Ry’Meer Brown scored 12 points in three quarters. Jersey Shore thundered to a strong start this season before losing its next 12 games. A young team that will return most of its players next year, however, may have righted things at the perfect time, closing its week with hard-fought wins against Central Mountain and Southern Columbia. The Bulldogs rallied in dramatic fashion to win at Central Mountain before dominating the fourth quarter in a 61-44 win last Friday. This is a team that defeated Shamokin early in the season, so it has shown its potential, and regaining that winning feeling could provide a major boost. Sophomore forward Trevor Gee is coming on strong and was outstanding in the two wins. Gee twice reached career-highs in points, scoring 23 against Southern while adding eight rebounds and five assists. Tanner Lorson continues stuffing the stat sheet and 11 rebounds and 10 assists in a 2-point loss against Bellefonte. Eli Fishel added eight points and could be rediscovering the shooting form that had him averaging in double figures during Jersey Shore’s 5-1 start. The Bulldogs have sleeper playoff potential and just earning postseason experience will be big for a team that could be ready to make a big splash in 2020. Hughesville senior Devon Braden has been his team’s most valuable player this season and has recorded seven double-doubles. He produced 18 points and 10 rebounds in a 53-38 loss against Southern Columbia after going for 11 points, 12 rebounds and three assists in a 59-48 win against Line Mountain … South Williamsport boosted its playoff hopes when it snapped North Penn-Liberty’s five-game winning streak and won, 61-46. Pete Sinibaldi and Cole Lentz combined for 39 points and both had seven rebounds. Ethan Laudenslager added five assists … Muncy also gave its playoff hopes a lift, using a big second half to beat Benton, 54-31. Kolby Moyer scored a season-high 22 points and Noah Rymsza recorded a double-double with 15 points and 10 rebounds. Dylan Wilt was a point shy of a second straight double-double, pulling down 11 rebounds … Central Mountain’s Connor Soo scored a career-high 22 points in Saturday’s loss at Mifflin County. Tuttle is making a strong all-state case and was outstanding again last week, scoring 43 points and grabbing 21 rebounds. Tuttle has recorded a district-best 13 double-doubles and has 32 over the last two seasons. He was a force against Neumann, scoring 26 points, pulling down 13 rebounds and adding three steals. Tuttle is averaging 18.6 points and 11.2 rebounds per game. Ewing leads the area in scoring but does a lot more than that. In addition to averaging 23.3 points in three games, Ewing also averaged six rebounds and three steals. The junior guard leads the area in scoring, produced two 27-point games and hit a long, buzzer-beating, game-winning 3-pointer against Central Mountain. Not only is Thursday’s HAC semifinal a rematch of last year’s thriller, but it also is a potential playoff preview. Both league champions are serious district title contenders and this could be the first of two times they play each other. Both teams possess a lot of firepower and multiple players of producing big games. It should be quite a battle. 1. Loyalsock (21-1): The Lancers concluded a perfect HAC-II season last Tuesday, routing Midd-West, 81-22. Point guard Anthony Pastore owned senior night, scoring a career-high 30 points and draining six 3-pointers. Loyalsock has often hurt teams from the perimeter this season, much more than in the past, and consistently has made at least five 3-pointers a game. Coach Ron Insinger has led Loyalsock to its 37th 20-win season in his 45 years, driving home how impressive his tenure has been. Loyalsock has won 14 straight and will be tested in the HAC Tournament. A year ago, Loyalsock rallied from a 15-point deficit to beat Mount Carmel at the buzzer in the semifinals before losing to Danville in a thrilling championship. Danville also is the only team to beat Loyalsock this season. 2. 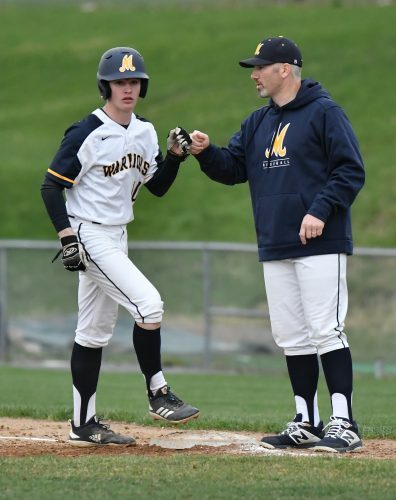 Montoursville (15-5): Reaching the HAC Tournament would be another sign of how far this program has come the last four years. Montoursville never whiffed that tournament before last season and is making a run this year after losing four starters from last year’s team and while featuring just one senior starter. The Warriors can match last year’s regular-season win total if they defeat Hughesville tonight and played well in a potential quarterfinal preview against Milton, winning, 61-30. Three players scored in double figures in that contest while sophomore guard Dillon Young grabbed 10 rebounds. 3. Wellsboro (18-2): Another outright NTL-I championship is 32 good minutes of basketball away. The Green Hornets will clinch another league title if they beat last-place Towanda tonight. Only once this decade has Wellsboro not won at least a share of the NTL-I crown. It also has not lost a league game in two years. A year after losing four starters from a district champion, Wellsboro has won 18 straight games and held off a furious St. John Neumann rally to win last Thursday, 52-50. Sophomore point guard Joe Grab has put together a strong campaign in his first season starting and scored 15 points while adding three steals against Neumann. He is averaging 10.7 points and 3.2 assists per game. 4. St. John Neumann (16-4): Speaking of teams dominating league play, Neumann clinched a share of its seventh straight Mid-Penn championship with wins against Sullivan County, Bucktail and Montgomery. The Knights won five straight outright titles, shared it with Millville and Sullivan last year and can win it outright if they defeat Millville Thursday. Doing so will be tough with the Quakers having just that one loss and leading scorer David Hill potentially not playing after suffering an injury against Sullivan. Neumann made a gutsy performance at Wellsboro, nearly overcoming a 15-point fourth-quarter deficit. 5. 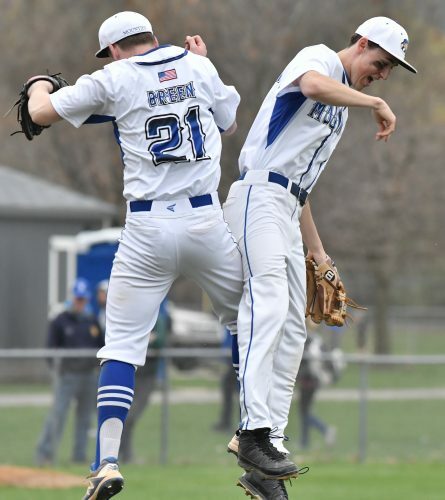 North Penn-Mansfield (16-6): Dylan Meyer has been one of the area’s top post players the past two seasons and was outstanding in three wins last week that put North Penn-Mansfield back into the NTL Tournament. Meyer matched a career-high 30 points and added 12 rebounds in Saturday’s 80-67 win over Athens. He also recorded a double-double in a 62-60 thrilling win against Troy, grabbing his 500th career rebound in the process. Jayden Andrews and Brent Burleigh also are having strong seasons and Andrews scored a season-high 14 points against Troy. He made seven steals against Athens, while Burleigh scored 14 points, dealt six assists and made four steals. Masse may be reached by email at cmasse@sungazette.com. Follow him on Twitter at @docmasse.